Losing weight is hard to do, but it doesn't stop us trying: 70 per cent of women have dieted in the last 10 years. A visitor from a far-off planet observing the way we behave could easily assume that dieting is a very good idea. We do it all the time. Dieting is so popular that in the past 10 years it's estimated that around 70 per cent of the adult female population and 30 per cent of all adult males have been on one. It doesn't seem to matter whether it's the Atkins diet or liquid diets, people will try almost anything in their frantic desire to shed a few pounds. Unfortunately, the results are usually the same. 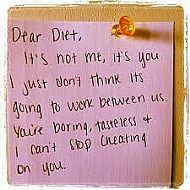 Although diets do produce results in the short term, very few dieters maintain their weight loss, no matter which diet they try. Worse than this, most dieters end up bigger than they were before they started dieting. So, why don't diets work? Most diets involve a significant change in a person's normal eating habits over an extended period of time. But habits die hard; we cling to them because they fit in with our lifestyle and the people around us. And changing something that is second nature to us very often results in stress - especially if that change is at odds with the habits of those in our social and family world. Dieting is also hard because it relies on our willpower to keep us on the right track. Willpower is often very strong at the start of a diet when we are desperate to change, but it can ebb and flow with the state of our health and the pressures and triggers of day-to-day life. Dieters rarely think of rehearsing how they will manage in difficult situations such as going out to dinner with friends; they just hope their willpower will hold up and punish themselves if it doesn't. Willpower is hard to maintain for extended periods of time, especially if our dietary rules are too strict. There's also the danger that when we feel like we've made some progress in our diet, we become less inclined to put ourselves through the struggle of restricting our food. So dieting is hard because people haven't learned the difference between willpower and commitment to long-term behaviour change. People often eat to help deal with emotional problems, rather than because they're hungry. This is normal, but some people gain weight because they turn to food for emotional comfort or to cope with negative feelings like anger or loss - for example, after a bad day at work, after a row with a loved one or as an end to a long week. Dieting doesn't solve the problem of emotional eating. If anything, it makes people more depressed because it becomes one of the issues that causes overeating. And losing weight can make things worse, because people have to cope with the pressures and expectations of their new body shape. The only people who lose weight and keep it off are those who make permanent changes to their own eating and exercise habits, and to those of their families. Too often those old eating habits will creep back in, no matter how much weight has been lost, and in time you'll find yourself back at square one. Lifestyle changes are the answer, not diets. In a world full of temptations, it's laudable to want to be a healthy weight and to manage your eating. However, dieting as we know it is not the way to do it. For long-term weight loss, many things - not just your nutritional habits - will have to change.